as I am pretty sure I am not the first person to create this 3 ingredient dish, but I had never heard of it so I invented it in my little world. My adopted Godfather Michael Dunne is an incredible (and a bit famous) professional photographer. He is semi-retired but still always working on something. This was in 2009 and I decided to cash all my airline miles in for round trip tickets, first-class (I had a rough year so I splurged) from Los Angeles to London. I was visiting a dear friend in London, a place I used to go multiple times a year for work. I spent some time in Ireland and decided to spend a good portion of time with “The Dunne” as my family affectionately calls him. I was spending a week or so with him learning tips and tricks about photography, assisting him on a photo shoot for an advertisement, traveling around the country shooting for practice, it was glorious. The shoot we were working on was a still life of herbs, spices and food for a tea company if I recall correctly so my idea stemmed from some of the elements we used for the photo that day. That evening he was making a roast chicken and I was put in charge of a side dish. 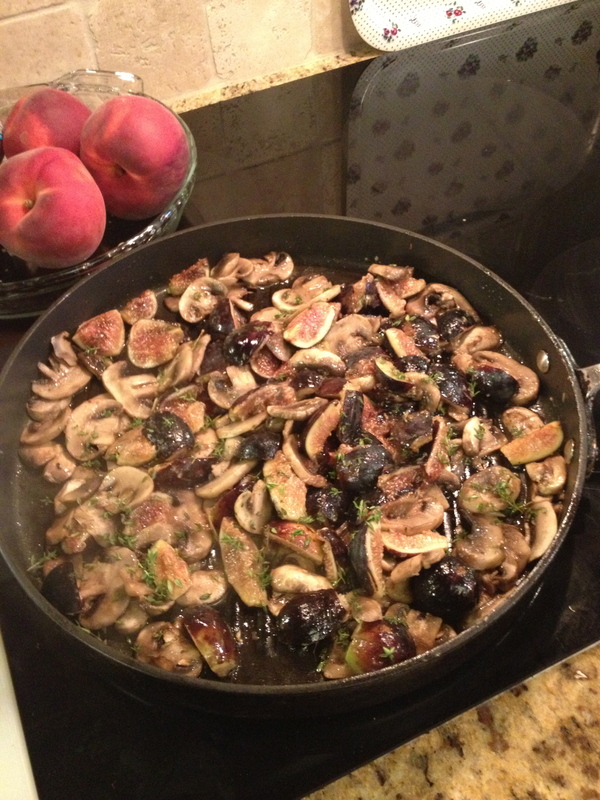 We had these beautiful mushrooms from the shoot, along with fresh springs of thyme. When we went to the market to pick up a few things, I found fresh figs and of course had to buy them, even though I had no plan. So while we laughed and he told me many stories about shooting photos around the world in the 50’s through the 80’s and working with my mother on shoots we polished off a bottle of white wine before dinner and I put this dish together. The results? That’s it. Now I will warn you this dish is not “low calorie” as it looks or as “healthy” as it appears because the key ingredient? Butter! Ah Julia Child you were right! You could substitute the butter sure, but then the dish will not have the same flavor. In England I used salted butter, as they don’t really understand “unsalted butter”. Here I used whipped butter that was lightly salted. If you use unsalted you can add salt to taste. Clean and slice your mushrooms. 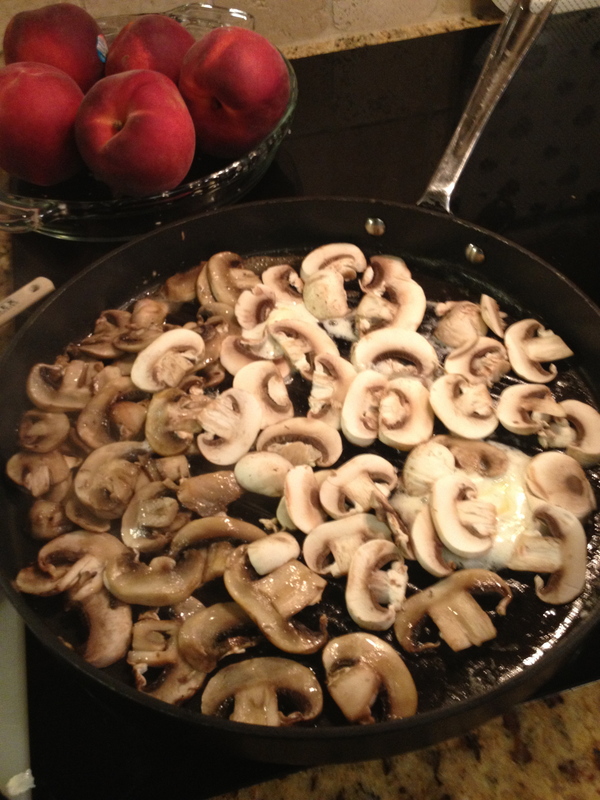 Put a few pats of butter in a large skillet pan and then add the mushrooms. I am breaking my own rule here by “crowding the mushrooms” in this photo, but the kids were yelling, and Nonna was urging me to hurry up as the rest of dinner was ready. Normally I do in 2 batches to get them evenly browned, but you can’t always be a type A perfectionist. And by “you” I really mean me. Regardless they taste the same. 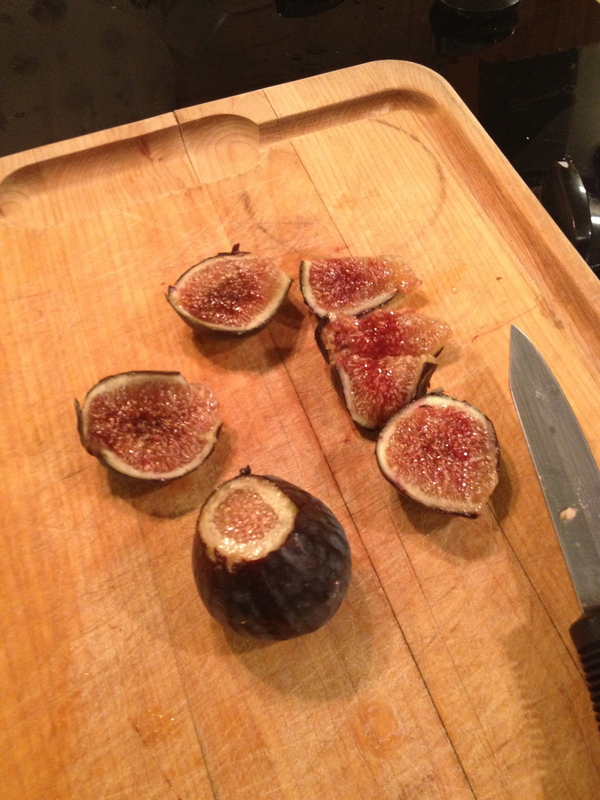 Next up cut the figs into quarters and try not to eat them all while you do it. Again speaking of myself. And my family, I actually had a wooden spoon at the ready to smack hands who kept sneaking in for them, they were particularly sweet and delicious. Totally ripe ones are fine, they will fall apart a bit while cooking, and the firm ones will soften but hold their shape. 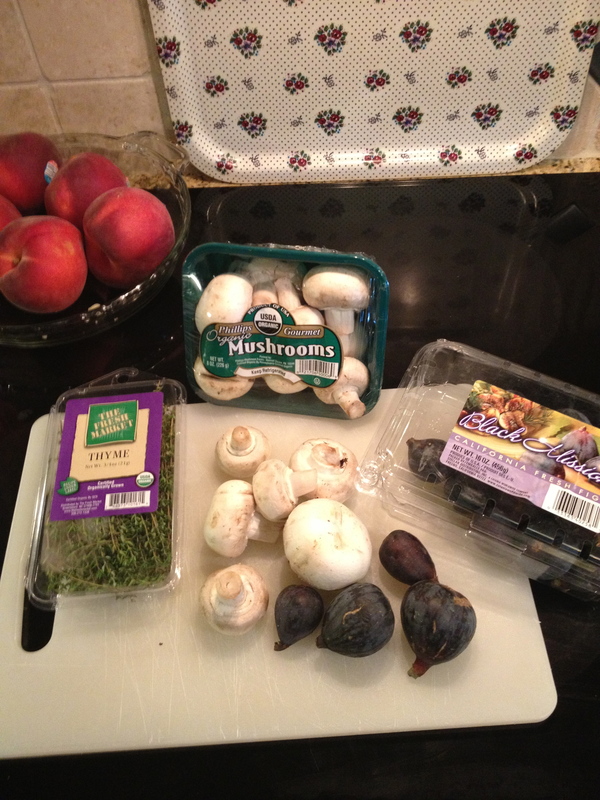 Once all the mushrooms have browned up….oh and do NOT be scared to add more butter! I never am. So once they are ready add the figs and mix together. Then take your thyme branches and carefully strip them of the thyme. I like to do this over a bowl so I can pull out the “branches” or woody part that inevitably ends up in there no matter how hard I try to not let that happen. Be generous. In one of those pre-packaged fresh thyme from the grocery store, I use about a third. Toss that thyme in there and mix it up well. Pretty delicious looking huh? And the smell? Ah Marone! So good. Let them cook together on a med low heat for about 10 mins occasionally mixing it around. If you used unsalted butter you may want to add some salt at this point. Pepper is your prerogative, I don’t use it. Remove from heat and serve while warm. We had these at a family dinner. Nonna, Mama Sis and Ladybug all loved it. Littledude? Well he is entering the full-on-picky-eater stage of toddlerhood much to my dismay. I tried to explain the importance of him trying all of Zia’s food for her blog. He pushed his plate away. Note, 2 nights later was Sunday dinner at Nonna’s and she made her famous brisket – a recipe I hope to one day do as well and at the end she added the leftovers of the mushroom and fig side. We had several guests that night so I got even more reviews and I am proud to say all were positive! I feel guilty saying that I rather expected it but from the time in England years back I have made them multiple times, even on Thanksgiving always to rave reviews.